Crisismappers are converging in New York City this week for the 6th Annual International Conference of CrisisMapping. The term “crisismapping” is fairly loose as the global community includes diversity in maps, data informatics, humanitarian technology and research. We are a collective of people who use maps, data and technology for humanitarian aid and international development. This year’s theme is: Affected Communities in the Spotlight. ICCM continues throughout the weekend. The main event is Friday, November 7, 2014 with keynotes and ignite talks. This will be livestreamed so that you can watch along from home or offices. Join the Crisismappers community to learn and build with us. As the ICCM pre-conference training and field trips organizer is it my goal to unite the different disciplines in unique zones to build, learn and share. Our training offering is a community driven effort with 3 tracks: Maps, Knowledge and Mobile/Hardware. Sessions are ongoing all day today. The International Network of Crisis Mappers (Crisis Mappers Net) is the largest and most active international community of experts, practitioners, policymakers, technologists, researchers, journalists, scholars, hackers and skilled volunteers engaged at the intersection of humanitarian crises, new technology, crowd-sourcing, and crisis mapping. 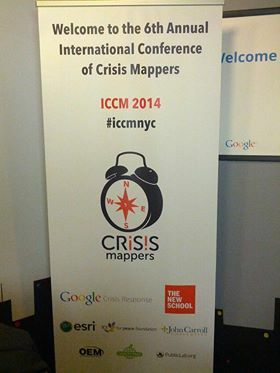 The Crisis Mappers Network was launched at the first International Conference on Crisis Mapping (ICCM) in 2009. As the world’s premier humanitarian technology forum, we engage 7,000+ members in over 160 countries, who are affiliated with over 3,000 different institutions, including more than 400 universities, 50 United Nations agencies & projects, first responders operating in both the civilian and military space, dozens of leading technology companies, several volunteer & technical community networks and global, national, and local humanitarian and disaster response and recovery organizations. The Maps track including many diverse map software organizations and communities. Sessions include Google (Christiaan Adams), CartoDB (Andy Eschbacher), Mapbox (Matthew Irwin, Aaron Lidman), Ushahidi (Sara-Jayne Terp), HOT/OSM/American Red Cross (Chris Daley, Dale Kunce) and ProPublica (Brian Jacobs sharinig about remote sensing verification). Research/Knowledge: What is the impact of Crisismapping? What are some ways to monitor and evaluate projects? Which ethical scenarios do we encounter? How can design of a map or data collection tool change the data? 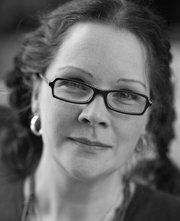 Can we use human centered design? What is the current state of research in crisismapping? Natural hazards with low frequency can lurk in history’s invisible depths. How do we use open data to help affected communities to map and see these risks? How can open data help governments and donors invest in building resilience in the areas which have the highest impact for affected communities? Learn the tools that the World Bank’s Global Facility for Disaster Reduction and Recovery has built to use Open Data to drive Resilience. technology projects. Cristian Silva, Director, IFIFT, will highlight our experiences in Guatemala participating in the Multidisciplinary Field School: Forensic Investigations. We will then respond to questions from those in attendance. This will be followed by a brainstorming session with NYU GIS Librarian Andrew Battista and NYU Senior Technology Specialist Him Mistry coordinated by Colette Mazzucelli and the ICCM 2014 Team. Mobile and Hardware (eg. mobile apps, Google Glass, imagery, satellites, drones etc) are incorporated into many crisismapping projects. Crisismappers are exploring new technologies to collect data and map in the field. This session will highlight tools and techniques. This workshop will explore the idea of inclusive technologies. What makes a particular technology accessible in a certain place and time? How can implementers assess their operating environment to choose technologies, channels and tools that best fit their needs? We’ll be looking at how to determine the accessibility and usability of different initiatives for different projects and contexts. Do people own or have access to mobile phones? Do they use SMS? Which mobile networks have coverage? How can SMS empower community workers? We’ll also cover how to map out your project in a simple way that exposes risks and incentives. We have been working for the last two years in a system that allows anyone to quickly prototype and build mobile applications for crisis mapping and other humanitarian ends. The project name is PUNYA (http://air.csail.mit.edu/punya/), and it is completely free and open source. This session will be discussing and testing disaster responding scenarios with ICT tools (SMS). In this workshop we will look at some examples of how health promotion is leveraging mobile – including near field communication, SMS and smartphone apps – to work with communities to build relevant, iterative tools for health. Let’s crowd-source some successes and failures in health and mobile tech and check in with where things are going from the local to the global context. From Balloon Mapping to oil testing kits, Public Lab is leading the way with environmental data collection. How can we have the earth talk to us and how can we collect environmental information around the world? We can build our own sensors and stitch our own maps. This workshop will teach you the skills in an urban setting. Occupy Sandy and local communities built placemaking and infrastructure to communicate and support a community in need. Emergency managers are building programmes to make the region more resilient. How can crisismappers learn from this field experience? Office of Emergency Management - City of New York (Jim McConnell)New York City has one of the largest urban emergency ops centers. In this field trip, you will learn about their work and how they use crisismapping techniques. Thank you to all the organizers, sponsors, participants and especially the Black Box Communications team for making this a success.